Often used in conjunction with gateways or other measures, colored surfaces or textures emphasize the presence of traffic calming features. Pavement surface treatments (Shauna Hallmark et al./Institute for Transportation). Colored surfaces or textures are common traffic calming treatments in Europe and are often used in conjunction with gateways or other traffic calming measures to emphasize the presence of traffic calming features. Surface treatments are usually implemented on the full-width of roadway and can be done with pavement markings. Surface treatments draw attention to the fact that something about the roadway is changing. They provide visual clues and, in the case of textured pavement, an auditory clue to drivers that they have entered a different area. Textured surfaces are typically placed in transition zones before entering towns and are used in conjunction with other techniques (i.e., landscaping). Colored surface markings should be skid resistant and placed across both lanes so drivers aren’t tempted to change lanes to avoid the treatments. An initial reduction in speed often occurs after installation. Surface treatments are considered most effective in combination with other techniques. Colored surfaces may be less effective particularly during winter months due to snow or ice cover. 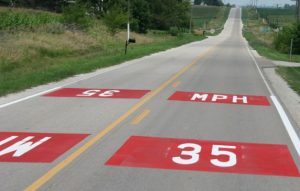 Colored pavement markings (a large red rectangle or bar across the lane and 35 MPH) were applied outside of a small rural community in Iowa. The study found that the markings were very effective with reductions in mean speeds up to 7 miles per hour (mph) and in 85th percentile speeds up to 9 mph. Besides the initial cost to paint the roadway and subsequent costs to maintain, the cost of painted roadway surfaces is generally low.